"Death Egg Robot" redirects here. For the Sonic Mania boss, see Death Egg Robot (Sonic Mania boss). For the Sonic Forces boss, see Death Egg Robot (Sonic Forces boss). 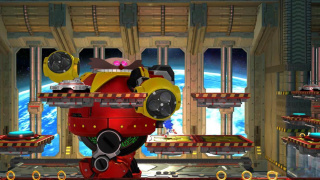 The Giant Mech boss battle, known in Sonic Generations as the Death Egg Robot takes place aboard the Death Egg as seen in the Sonic 2 stage. Eggman's mech rises from inside the station to take on Classic Sonic in what looks to be a similar manner to the Genesis stage. He walks at you, and fires his arms after aiming at you with a targeting reticule. The way to fight him is NOT the same as before, as instead of hitting his exposed belly, you need to hit the robot's backside once it tries to leap on you. Run under him, and hit his exposed rear to damage the boss. It will repeat this phase once more. After two hits (four hits in Hard mode), the rising platform finally reaches a familiar sight with the backdrop of the planet below, in space. Eggman will attempt to smash you once more, this time sending you flying onto the side platforms surrounding the robot, beginning Phase 2. In this phase, Eggman will attempt to home in to your position with his arm as before, but this time you can stop him. By hitting a button on these platforms, you will set off a time bomb, which will go off in a matter of seconds. If you make Eggman aim at you near a bomb, he will hit the bomb and his machine will lock up. Now you can get onto his arm, and roll over to his machine, where a simple jump will hit his head and damage the bot. Repeat this once more to defeat the robot, which will earn you a Chaos Emerald. The ending cutscene here shows Eggman getting sucked into the Time Eater, further confusing our heroes. This page was last edited on 20 May 2018, at 11:14.